Hi, I'm trying to use a 0.8mm nozzle on my ormerod 2 with a Chinese E3D V5/V6 clone on. I'm using 1.75mm PLA and I've upped the temp to 230,lowered the speed slightly and changed the path widths and things like that but I'm having a lot of issues with layer bonding. Any time the run is of any length it just lifts. Short sections when the nice line is placed quickly after the first work well but if it has a long straight line and then comes to deposit the next one it starts lifting like a wave and there is no layer adhesion. Does anyone have any settings or recommendations? Hi, I've got 0.65mm layer height. Will have to check other stuff. I have just made a huge improvement to it by blocking up the fan duct pointing at the work. My duct splits a single fan into two, part going to head and part going to the work. I've filled the work half with blu-tack to stop the airflow and its bonding much much better. It looks like there is still a fill to perimeter issue but I can work with that. This is much better layer and fill adhesion but there must be a perimeter issue. They have lifted and caused a bowl also the fill doesnt go far enough out. ...also the fill doesnt go far enough out. ..or it did not stick and was drawn back a bit on the return? I agree with Erik that your first layer is printing too high (Z zero setting too high). This results in the extrusion width being too thin, which in turn means that the infill will not quite reach the perimeter and so get pulled back. As far as layer bonding is concerned, stopping the cooling air was a good move. Slowing the print will also help by having the molten filament in contact with the previous layer for longer and also slowing the feed rate - the nozzle heater may not be powerful enough to completely heat a high plastic flow up to the set temperature. Increasing bed temperature will also help for models that are not too high. 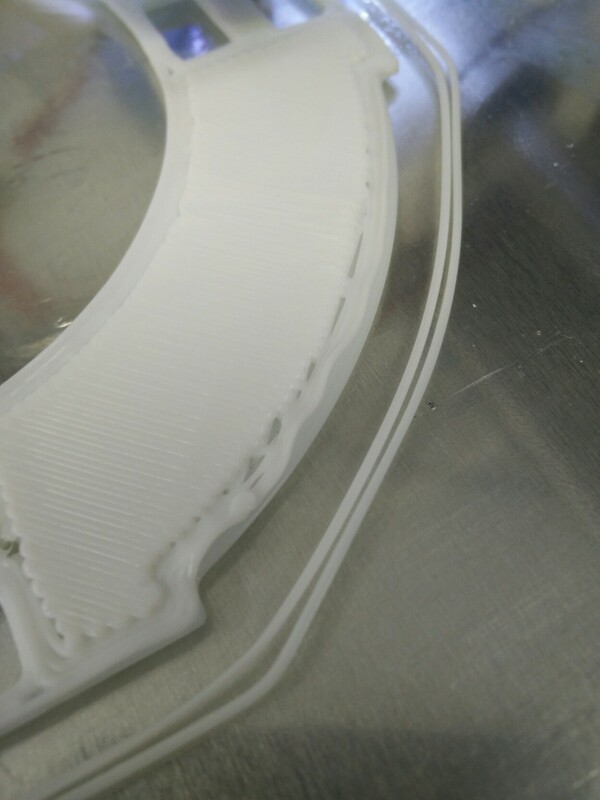 Thicker extrusions are likely to increase warping issues, which is perhaps what you are also seeing.